Situated in the swanky La Vista neighbourhood in Quezon City, Metro Manila, Philippines, this residence looks out to the Marikina Valley and the Sierra Madre mountain range beyond. The work of David Mirasol Design Studio (DM Design Studio), the building is wrapped in Italian silver travertine, imbuing it with understated opulence. The owners—a scion of an old sugar plantation family in the Visayas, and his wife, a woman with keen interests in cooking and holistic wellness—are passionate art collectors and travellers. Architect David Mirasol was tasked to oversee every detail from the architecture to the landscape and interior design. "Being a multi-disciplinary designer, I enjoy designing the architecture, interiors, landscape and lighting,” says Mirasol, also the founder of his eponymous studio. In fact, Mirasol directed the entire process, even right down to the choice of materials and artworks. To create a house that fulfilled the owners’ requirements, the design firm introduced four-metre-high ceilings, floor-to-ceiling glass doors and windows, and slim structural columns to achieve the effect of airy lightness. These doors and windows face south and north towards the garden, to maximise the natural light and allow the owners an expansive view of the surrounding greenery. A light colour palette enhances the feeling of airiness. 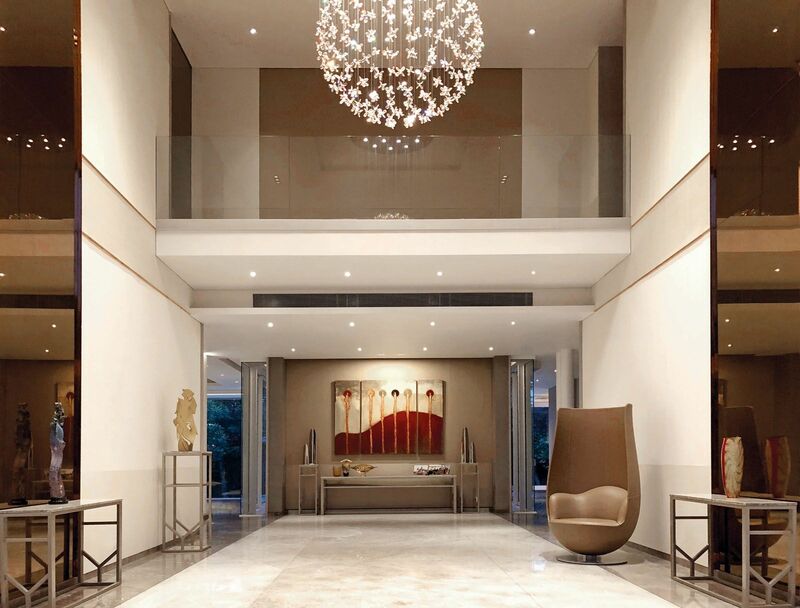 At the entrance, the double doors open to a soaring double volume foyer. Guests stepping across the threshold are greeted by the stunning Flowers chandelier by Windfall, made up of intricate globe comprising crystal buds and blooms. The living room lies to the left of the foyer. The couple and their two children enjoy the view of the gardens and pool through the full-height glass windows, and the collection of artwork and crystals. Linking all three storeys are the lift and main staircase, a sculptural folding metal and solid rosewood construction, with a freestanding glass rail and trimmed with solid copper strips on the steps. At the foot of the staircase is a Murano glass sculpture. A health and fitness room on the ground floor has a medical-grade infrared sauna, a half-tub for soaking and a spa bed. An elliptical machine, stationary bike and free weights occupy another corner. To the right of the foyer are the dining room and kitchens. The gourmet kitchen has a view of the pool and gardens. It is outfitted with Scavolini modular cabinets and appliances by Gaggenau while the island counter is topped with Silesian Italian quartz. There is also a generous pantry. The gourmet kitchen connects to the Asian kitchen service area below and the study above via a food lift. The lady of the house loves cooking and entertaining, and the 14-seater B&B Italia leather dining set with a customised marble tabletop impresses guests dining under the glow of the Scarlett chandelier by Windfall. On the leather-panelled wall is an original work by American artist Dale Chihuly. The right wing of the house also contains a memento room, where the owner displays his mother’s portrait, collections of china and silver and gowns by Filipino fashion czar Pitoy Moreno. In the family room, to showcase the objects the couple has gathered on their travels to almost 100 countries over the past 20 years, the architect designed a generous cabinet system. Larger pieces are placed in the nearby study room. There are a total of four bedrooms—the master suite, a suite for each of the two children and a guest suite. The master bedroom comes with a generously-sized 550sqft balcony, fitted with a two-seater and table to take in the garden views at breakfast or tea. This spacious bedroom also features a pair of walk-in wardrobes, one on each side of the bedroom, for him and for her. Likewise, in the bathroom, for him there’s a rainshower bath, while she gets a steam bath and free-standing tub, all by Gessi. The bathroom overlooks the green wall courtyard, creating an experience of seamless tranquility from one space of the home to another. From the dining room, living area and gallery, there is direct access to the outdoor terrace, which leads to the infinity lap pool, the garden stairs and 4,000sqft of landscaped gardens. A waterfall plunges from a feature wall into the infinity pool, which overflows into a lower pool below. Specially appointed speakers piped music into the gardens, further adding tranquility to the greenery. Mirasol conceptualised the garden to be an open space shielded by bamboo, creating an intimate courtyard ambience. African tulips and striking 50-year-old plumerias adorn the lawns. At night, a dramatic yet peaceful mood is evoked by lighting and the music. A rainwater collection system to irrigate the garden is a key sustainability feature.